Games Like World of Warcraft (WoW) '+g+"
World of Warcraft (WoW) is a popular massively multiplayer online role-playing game (MMORPG) published by Blizzard Entertainment. With over 8 million subscribers as of March 2013, World of Warcraft is currently the world's most-subscribed MMORPG, and holds the Guinness World Record for the most popular MMORPG by subscribers. 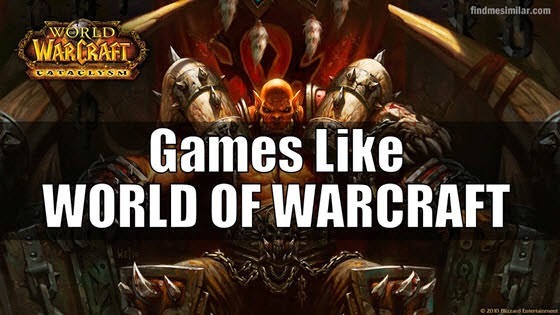 If you like playing more MMORPG games like World of Warcraft (WoW) then check this list of recommendations for more games similar to World of Warcraft below. Guild Wars 2 is a massively multiplayer online role-playing game developed by ArenaNet and published by NCsoft. Set in the fantasy world of Tyria, the game follows the re-emergence of Destiny's Edge, a disbanded guild dedicated to fighting the Elder Dragons. SWTOR is a massively multiplayer online role-playing game (MMORPG) based in the Star Wars universe. Players can choose to join as members of – the Galactic Republic or the Sith Empire.Player advancement occurs by a combination of mission completion, exploration, and defeating enemies. Runes of Magic (RoM) is a massively multiplayer online role-playing game (MMORPG) developed by the Taiwanese developer Runewaker Entertainment. The game is free to download, and no monthly subscription fee is required because the service is funded by real money transactions (RMT) in the Runes of Magic Item Shop. Rift (previously known as Rift: Planes of Telara) is a massively multiplayer online role-playing game (MMORPG) set in fantasy world called Telara, which is the focal point of several different elemental Planes. Warhammer Online,...if you can think of more, then don't forget to mention it in comments.